This piece is made using white satinique cord. The length can vary from about 15 1/2 to 18 1/4 inches with a center jeweled piece that adds 1 3/4 inches. The necklace needed nothing more than the gorgeous lampwork glass pendant! The pendant is heart-shaped clear glass. Contained within it is a beautiful flower design whose color varies from white on the outer edges to a dark teal in the center. 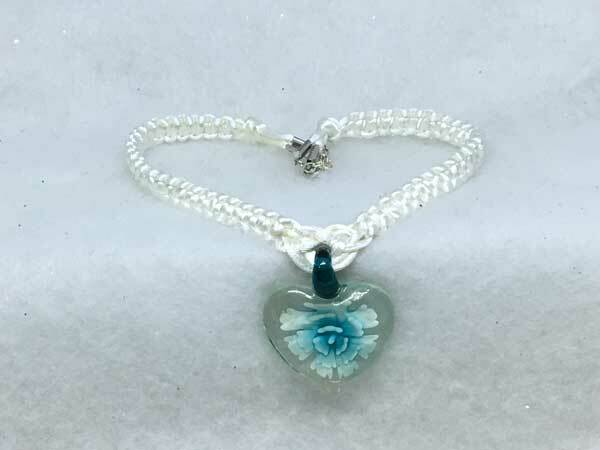 The part of the pendant that connects to the cord is a dark teal. The piece is finished with a lobster claw clasp and added chain for more versatility with the length.